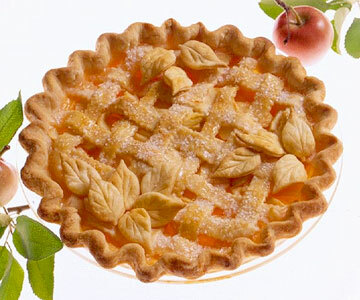 Fold in maple syrup and whipping cream with the apples to add a delicious twist to this apple pie. Prepare and roll out pastry for double-crust pie. Line a 9-inch pie plate with half of the pastry. Set aside. For filling, in a large bowl, stir together the 1/3 cup sugar, the cornstarch, and the salt. Add the apples and gently toss until coated. In a small bowl, stir together maple syrup, whipping cream, and vanilla. Pour over apple mixture. Fold until combined. Transfer to the pastry-lined pie plate. Trim pastry to 1/2 inch beyond edge of pie plate. Roll out remaining pastry and cut into 1/2-inch-wide strips. (Or roll out second portion of pastry to form a top crust; cut slits.) Weave strips over filling for lattice crust. Press ends of strips into crust rim. Fold bottom pastry over strips; seal and crimp edge. Brush pastry with milk and sprinkle with sugar. To prevent overbrowning, cover edge of pie with foil. If you like, place the pie on a baking sheet to catch drips. Bake the pie in a 375 degree F oven for 25 minutes. Remove the foil. Bake the pie for about 30 minutes more or until the top is golden. Serve warm or cool. Makes 8 servings. To make pastry cutouts on top of pie, roll out pastry scraps about 1/8 inch thick and use small cutters to form leaf shapes. Moisten with water and place atop unbaked crust. In a medium bowl stir together flour and salt. Using a pastry blender, cut in shortening until pieces are pea-size. Sprinkle 1 tablespoon cold water over part of the flour mixture; gently toss with a fork. Push moistened dough to side of bowl. Repeat, using 1 tablespoon water at a time until all the flour mixture is moistened (about 8 to 10 tablespoons total). Divide dough in half. Form each half into a ball. On a lightly floured surface, use your hands to slightly flatten 1 dough ball. Roll dough from center to edges into a 12-inch circle. To transfer pastry, wrap it around the rolling pin; unroll into a 9-inch pie plate. Ease pastry into pie plate, being careful not to stretch pastry. Trim pastry even with the rim of the pie plate. Fill pie and continue as directed.